Riccardo Gabriele introduced me to a group of Italian wines that he represents and asked me to speak about them to a group of wine writers. The Trattoria dell’Arte was the perfect spot for the luncheon and tasting. 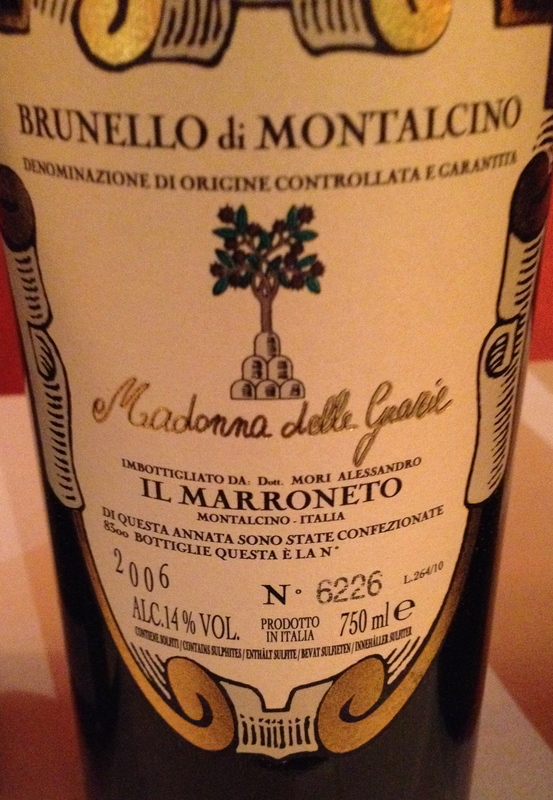 Some highlights were a wine made from pre-phylloxera grapes and another made from Tempranillo grapes – both from Tuscany! 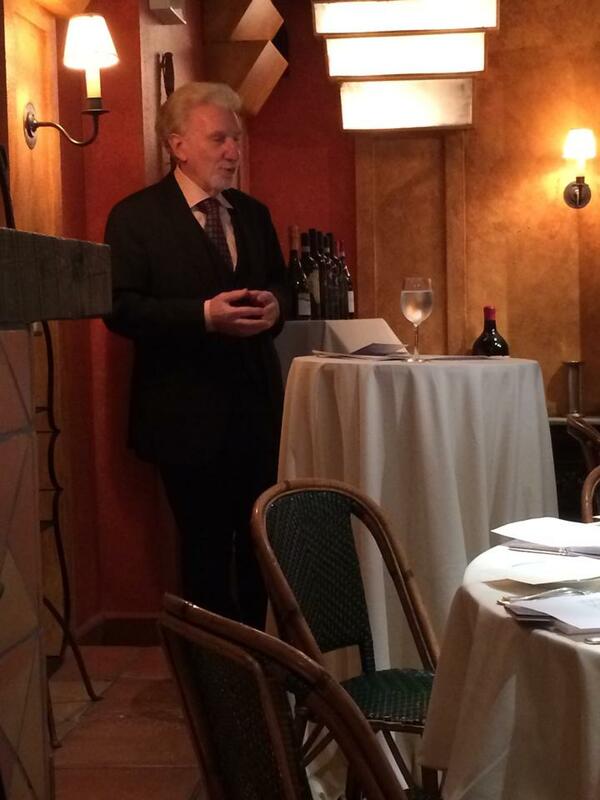 It was an exciting opportunity for me to taste and discuss these wines with other wine writers. 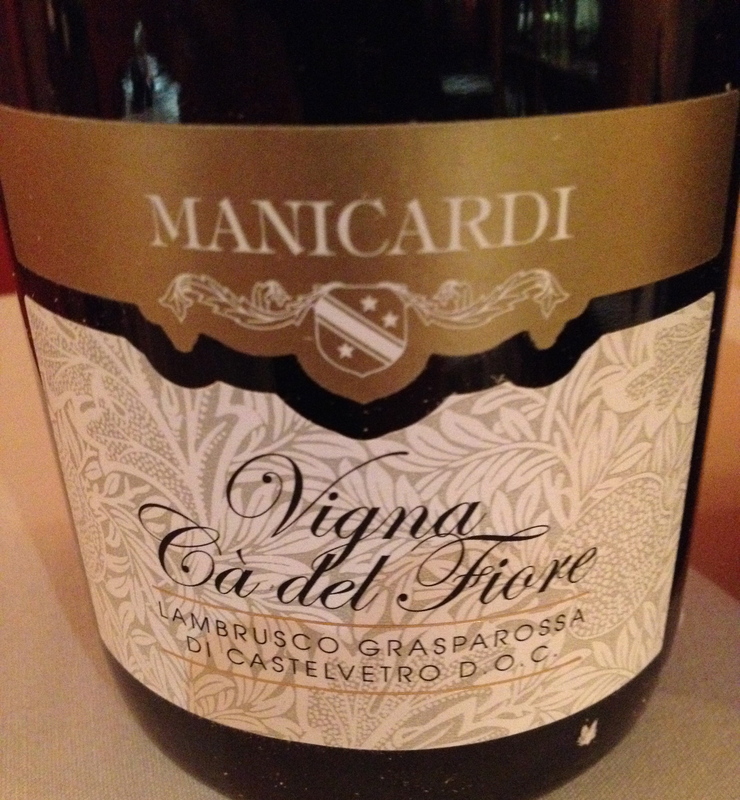 Manicardi “Vigna Ca del Fiore” DOC 2013 Lambrusco Grasparossa Castelvetro 100% Grasparossa. There are 2,600 plants per hectare and the training is cordon spurred. Fermentation and maceration is in temperature controlled stainless steel tanks. Second fermentation is by the Charmat method–cold maceration is in pressurized temperature controlled tanks and grapes must be stored under pressure and at 0ºC. This is a dry Lambrusco fruity and low in tannin, high in acidity which goes very well with the rich food of the Emilia region, such as cotechino, zampone, bolito misto, Parmigiano-Reggiano and prosciutto di Parma. In a restaurant outside of Parma I discovered a very simple but excellent end to a meal: a perfect ripe pear, walnuts, a wedge a Parmigiano-Reggiano and a glass of dry Lambrusco. I have been a fan of dry Lambrusco ever since. Lambrusco is a family of kindred grapes. The three best quality sub-varieties include Grasparossa (red stem), the darkest in color and the most robust. 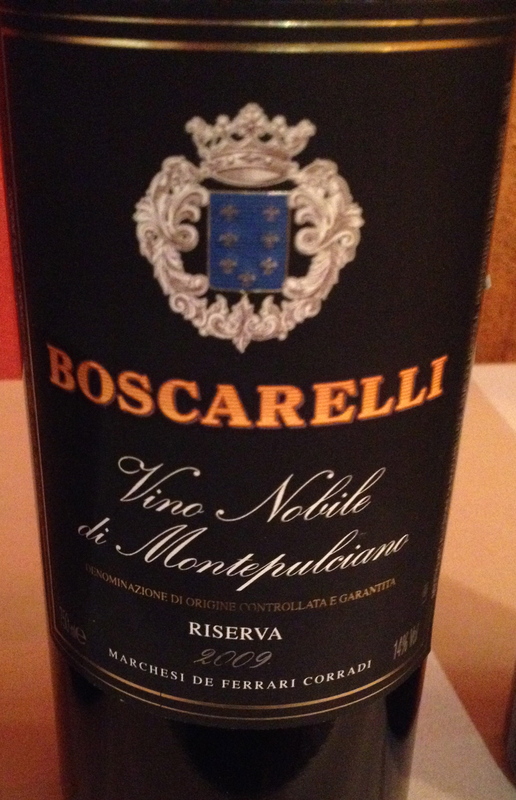 It comes from the village of Castelvetro, south of Modena, and is the one that I prefer. Sorbara, the most delicate, and pricy comes from the village of the same name. Salamino, meaning little salami, is so called because of the sausage-shaped bunches, comes from the area around the village of Santa Croce. 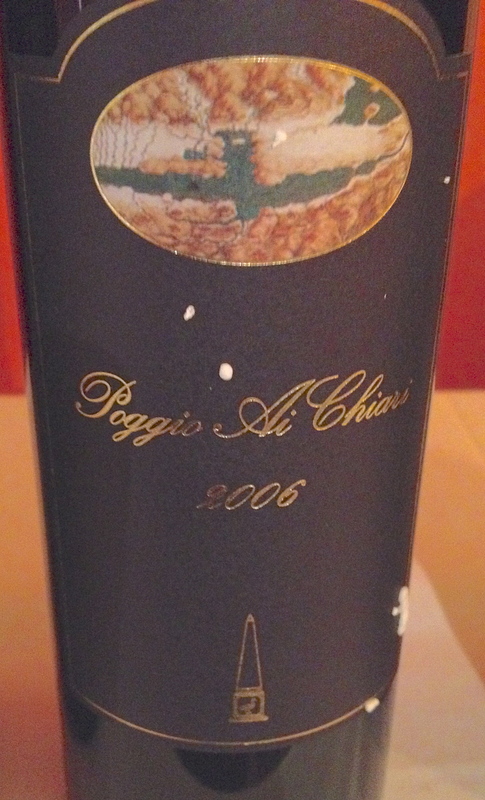 The wine is not imported in to U.S.
Colle S. Mustiola “Poggio ai Chiari” 2006 IGT Tuscany. 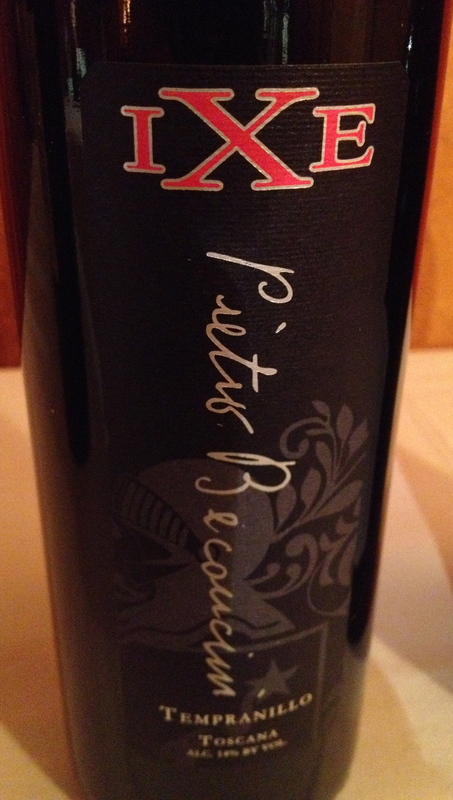 Made from 100% Sangiovese from a four hectare vineyard near Lake Chiusi in Tuscany. The exposure is northeast and the vineyard is at 300 meters. Flood soil with pilocene sand. There are 10,000 vines per hectare. The harvest takes place the second week of October. Maceration lasts for 40 days with submerged cap fermentation. There is spontaneous malolatic fermentation. The wine spends 36 months in barriques and a small part in Slovenian oak barrels of 20hl, followed by 24 months refinement in bottle before release. 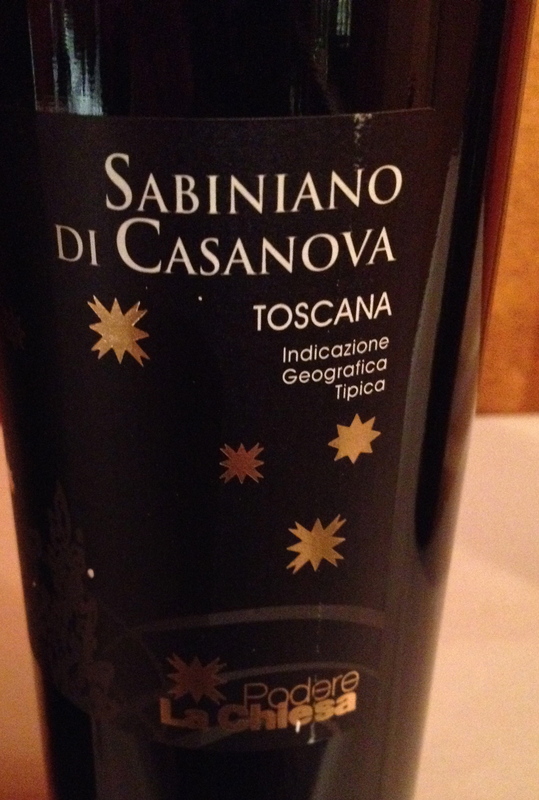 Podere La Chiesa “Sabiniano di Casanova” 2008 IGT Tuscany 60% Sangiovese, 25% Cabernet Sauvignon and 15% Merlot. The vineyards are located in Podere la Chiesa in Cassanova. The vineyards face southeast and southwest growing on a clay soil rich in fossil shells, typical of the area. Each grape variety is vinified separately. There are 2 to 3 pumpovers a day which protects the cap from oxidation. The training is cordon spur and there are 4,500 per hectare, which are hand harvested. Natural yeast is used and temperature controlled fermentation takes place in stainless steel. Maceration is for 12/15 days, 12 months in French barriques and 18 months in the bottle before release. Not imported. Beconcini “IXE” is the Tuscan pronunciation for the letter X. The letter X stands for unknown vines which turned out to be Tempranillo. The IGT is Tuscany Tempranillo. This wine is made from 99.9% of Tempranillo and a touch of Sangiovese. The winery is located in the town of San Miniato. The vineyard is 3.5 hectares and the grapes are all from the new vineyards planted in 1997 using a massal selection from buds taken from the century old vines of Tempranillo from the Vigna alle Nicchie. The training is spurred cordon. Soil is sandstone with marine fossil formation, well integrated with abundant clay. 100/150 meters above sea level and there are 7,000 vines per hectare. Harvest the first 10 days of September. The grapes are dried for 4 weeks and they obtain a total yield of 70%. Fermentation takes place in temperature controlled glass lined cement vats, maceration is for 3 weeks. Aging lasts for 14 months in 70% French barriques and 30% American oak barriques of second passage. 6 months in bottle before release. First passage in barriques is for the wine from the grapes of the historical vineyard Vigna alle Nicchie that goes into the wine of the same name. In the early 1950’s, 213 vines of unknown species were found in the vineyard which were called X vines. With help from the Ministry of Agriculture these vines were declared to be Tempranillo a few years ago. 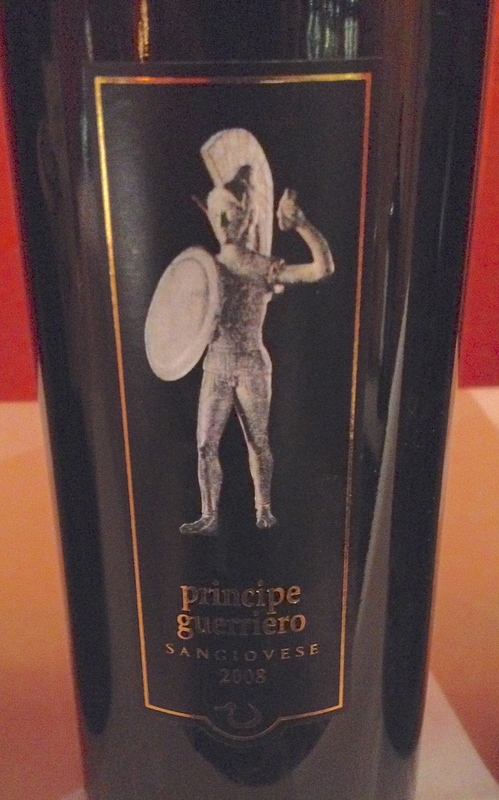 In June of 2009, Tempranillo N nero was enrolled in the Tuscan register. As far as I know Tempranillo was never cultivated before in Italy. The Via Franchigena was an old Roman road which was used by pilgrims in the 17th century to make the pilgrimage to and from Santiago de Compostela (Rioja) in Spain to Rome. This road passed close to the town of San Miniato near where the winery is now located. Spanish pilgrims may have carried the Tempranillo seeds and actually sewed them in the vicinity of San Miniato as was the custom of the time. Scientists have determined that the vines were from seeds, not cuttings. Legend has it that a local priest tended the vines not knowing their origin. Not imported.